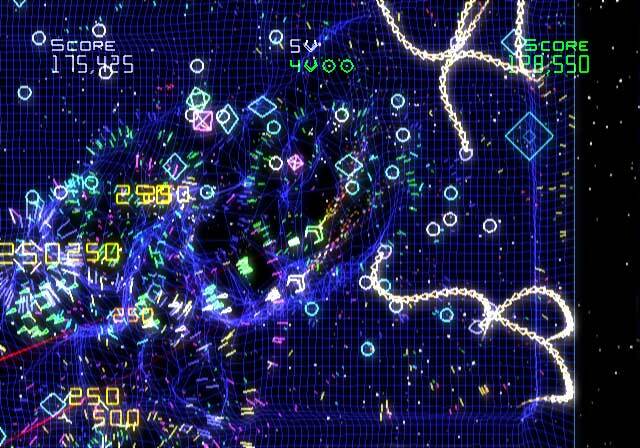 If you have ever played Geometry Wars Evolved for the Xbox 360 Live Arcade, and you liked it, then you will really like Geometry Wars Galaxies.The title pretty much follows suit with the original in that you fly around the screen, shooting in all directions. However, where the original XBLA game only had so much to go on, Galaxies expands further in a few ways. The first noticable change is that you are not flying solo anymore, you have a little turret for a friend. As you gain Genoms ,the currency of the game, you will be able to unlock different behaviors for you comrade. The behaviors you can unlock are; Attack, Defend, Sniper and so on ( read our Geometry Wars Galaxies Guide ). These traits all start out very weak, but each time you play you earn experience for the selected trait. When fully powered, they are a serious force to be reckoned with. For example, once “Attack” is maximized, the player will have roughly double the firepower whenever shooting. Other traits expand on speed or distance that the drone can stray from you. For each stage, you can earn either a bronze, silver or a gold medal, collecting “geoms” (little glowing spheres) as you go. All foes release Geoms. These Geoms function as points to purchase access to new worlds and solar systems, as well as new drone traits. Each also adds to the multiplier, making it possible to have a 150x multiplier. The Wii remote and nunchuk work well for the most part, although aiming the remote for your firing direction takes practice. On occasion, the remote may read your direction wrong, forcing you to collide with an enemy. This kills your multiplier count – and quite possibly your chance at scoring the much-desired gold medal. However, Galaxies supports Nintendo’s Classic Controller, and playing with a pair of analog sticks makes this game that much more fun to play.